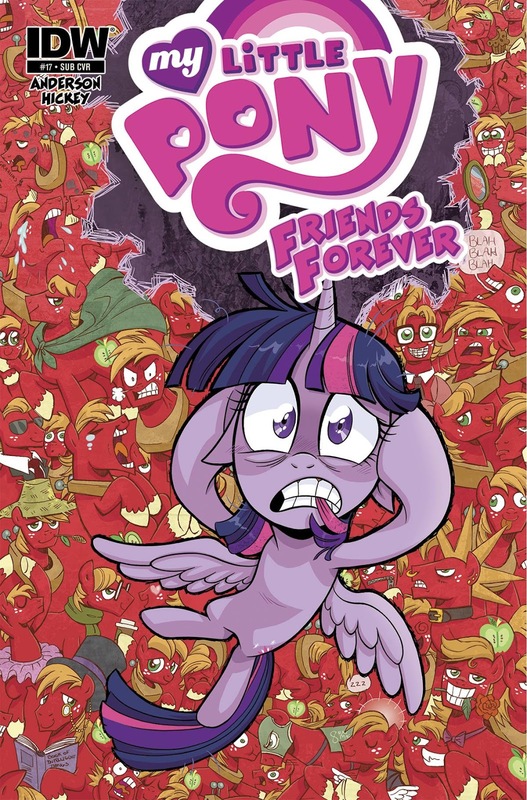 With no new comic today and the entire Friends Forever line reviewed on this blog, it's time for a retrospective. 38 issues. Three years of comics. There's a lot to go over and a great deal to celebrate or critique. Catch the full retrospective after the break! 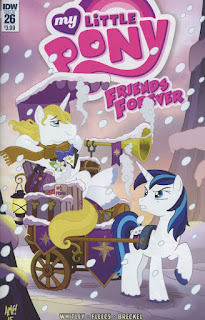 Retreading old ground as I did a review back when the series first concluded its run. Yet time and reviewing some of the older comics has given me other perspectives. Friends Forever had an infamous start but steadily grew to a point where I often thought that these short one-shots captured MLP more than the main comic line. Not always as there we some issues that fell short but a majority of issues either fared well or raised the bar. Yet I still revisit that awkward first issue and reflect on how close I came to abandoning the comic line. from following this cover more. There have been issues that featured questionable actions or artwork. There have been issues that misrepresented some characters or staggered the focus too much. Yet the thing about negative experiences is that they demand a reaction. Perhaps in describing why we have a negative reaction we can gleam what we expect and enjoy from the overall experience. Yet a non-experience is almost offensive, for it doesn't even demand a reaction. Friends Forever #1 is infamous for feeling like a non-event. The story feels more like a checklist of events and while it does nothing to undermine Pinkie Pie and Applejack, it doesn't show them at their best either. The artwork is decent but lacks vitality. 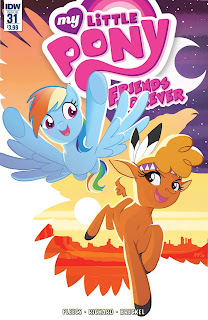 Given that the creative team behind this issue has not done a My Little Pony since, I get the sense this was a throw-away story just to get things going. Goodness, this is too adorable! 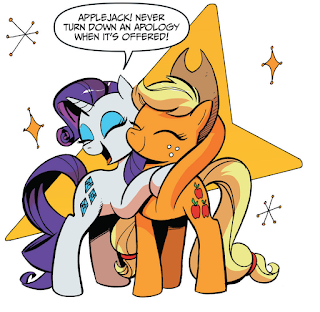 By the end of issue 2 I was considering not investing in the line further, until the CMC and Discord forged a bond I hadn't expected. Follow that up with Celestia and Spike sharing a connection in issue #3 and suddenly I understood. This issue was a gift itself. Every now and then Friends Forever would play it safe. 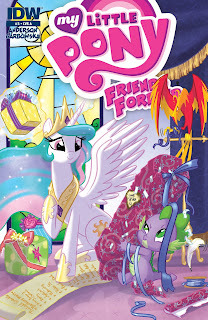 A comic featuring long-time relationships like Twilight and Shining Armor, Rarity and Applejack, and even the final issue focused on Celestia and Luna. These stories were often fun because they added to a relationship with which we were already familiar. Yet looking back I found that many of my favorites featured characters who have rarely shared the screen and yet somehow connected. Who would have thought that Rarity would understand Babs Seed's awkwardness? 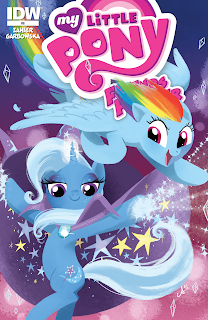 Or that Rainbow Dash and Little Strongheart would compliment each other so well? 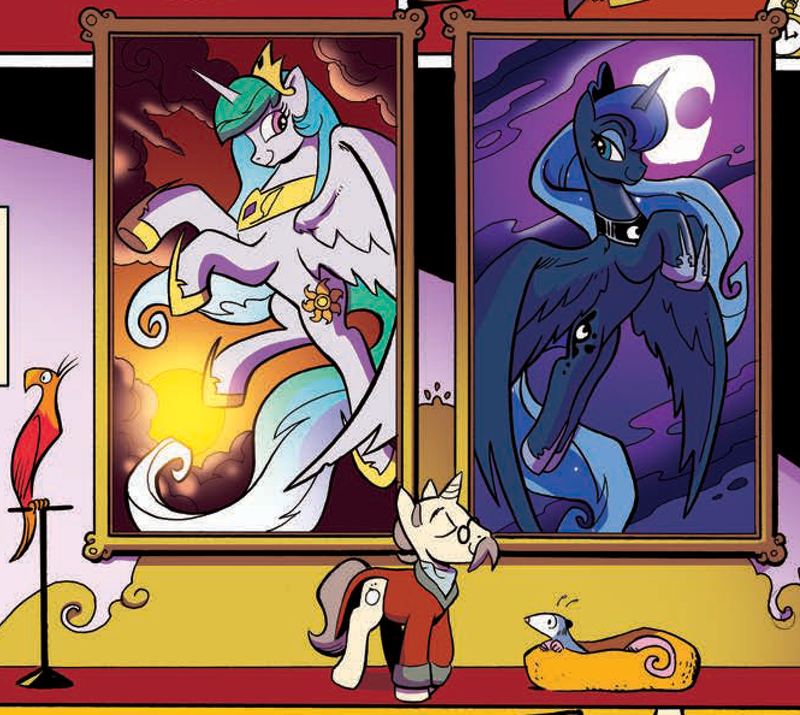 Even when the story didn't work out as well (such as with Rarity and Gilda), I still enjoyed the idea of going for unlikely match-ups. Name the largest ego on this cover. Friends Forever was willing to take risks on character combos, which is why it was often endearing. 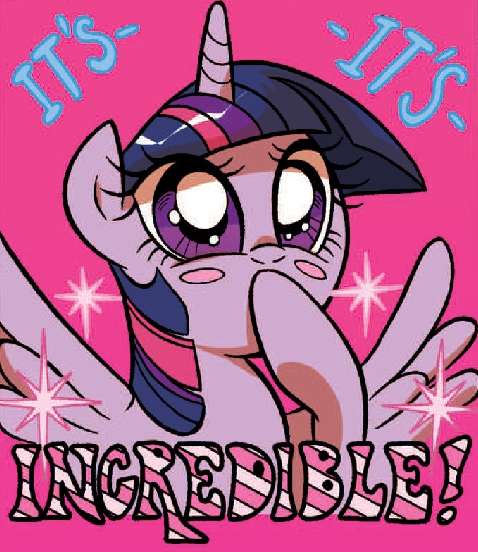 Sometimes this boldness would translate into expanding the world of Equestria. Rainbow Dash and Trixie established an entire Kingdom of Diamond Dogs while Spike and Princess Luna visited a dragon populace within Phillydelphia. It doesn't bother me if any of these stories have been rendered moot by the show. It's the willingness to take a risk and expand the world that I appreciate. This issue really went to the dogs. Imbalance, however, is less appealing. I put a lot of emphasis on the "friends" part of the title. To me, a friendship features mutual effort from both parties. Not perfectly balanced but close. There have been more than a few times that expectation works against the story. 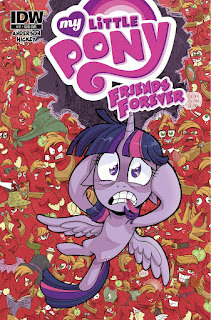 Case in point, I consider Friends Forever #17 to be a Twilight Sparkle story guest-starring Big Macintosh. 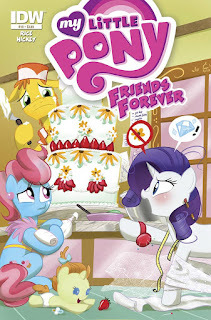 By the same notion, Friends Forever #19 focuses on Rarity digging herself deeper while the Cakes show their best at the very end. That's not to say these stories or poor. They were enjoyable but if the goal is to show two separate groups coming together, I find that a balanced presentation works best. This is what Mondays are like for me. Because with that balance comes a chance to explore both characters and appreciate how their prepositional could play off one another. It invites the reader's imagination and hopefully serves as an example of how strong characterization helps the story write itself. 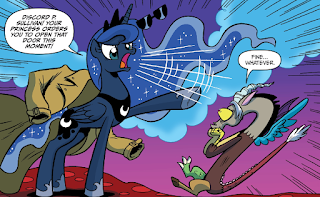 Take this panel out of context and it's still funny. But what about original characters? Just because this thing stars show characters it doesn't exclude the comics from adding their own. 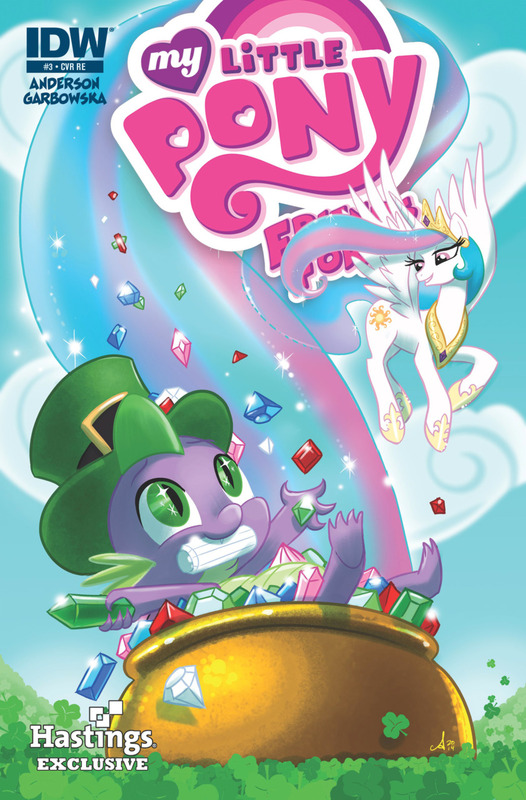 From the return of Kibitz to newcomers like Mina the dragon and Buried Treasure, there's plenty of new ponies and other creatures to recall. Some characters are worth discussing even if the comic does not revolve around them. Others often felt like a distraction as they demanded too much of one or another character's attention at the cost of the group dynamic. As a general rule, I think the best comic-exclusive characters were the ones who helped get the story going but bowed out long enough for the leads to perform their task. Ah, Kibitz. You are one of the comics' greatest gifts. 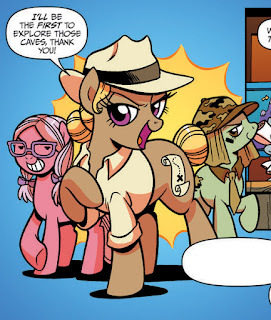 Welcome to the real Equestria. 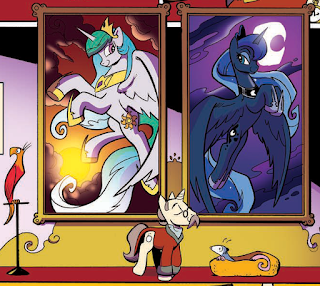 Luna and Discord had very little reason to be friends, given their history. And yet a journey into Discord's subconscious created a bridge that allowed the two to bond. 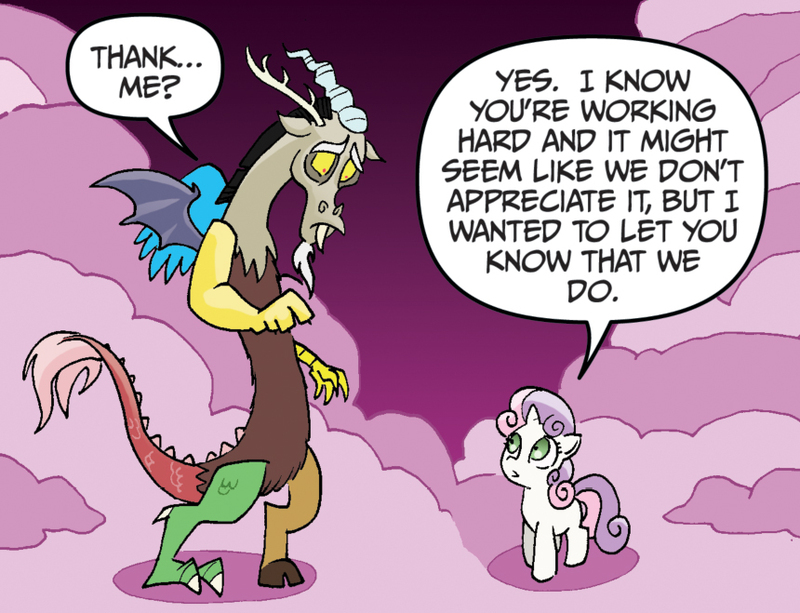 It even gets philosophical as Discord and Luna talk about the perception of balance and what it means to be following one's nature versus what is perceived. 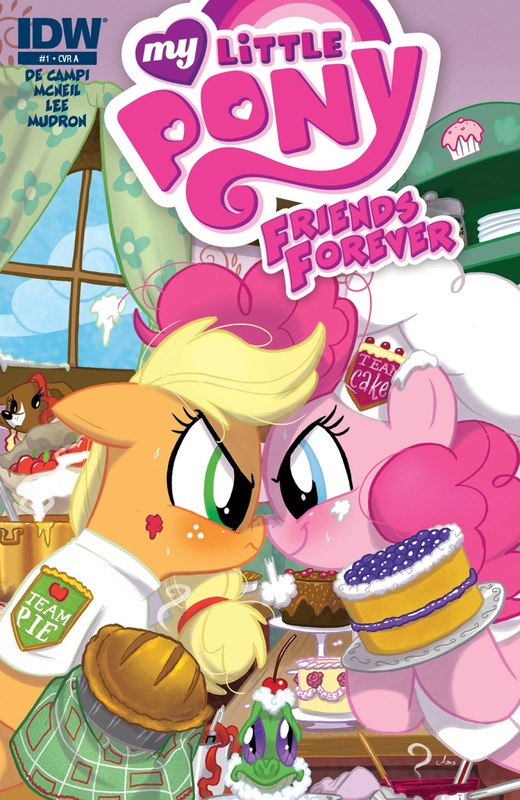 A fun story featuring two fan-favorite characters. That coffee mug is strangely accurate. This one flies in the face of much of what I just posted. Shining Armor is the focus but he is often set up to fail. It's Blueblood who gets to show his best while at the same time celebrating his worst. 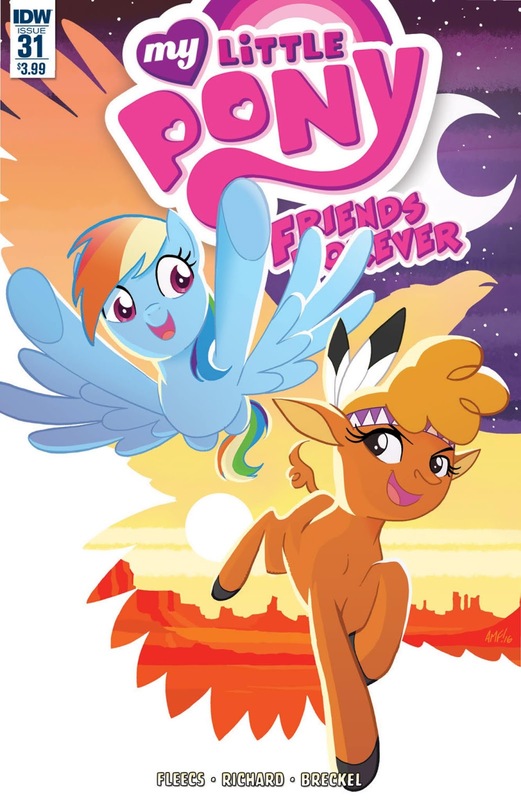 Yet this comic also took a risk in showing Yakyakistan long before the show and even fleshed out Blueblood a bit further. It's a fun story that takes advantage of under-utilized elements. Combine a deeper look at the Buffalo culture, fantastic artwork and fables, plus two independent characters working together and you've got a winner. Even as I wrote the review for this comic, new ideas kept presenting themselves. This one was a treasure. The luck of the dragon-ish! This became the standard against which I would view many other issues. 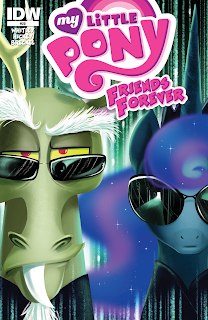 Combining the best of Spike and Celestia and forming bonds over several topics, this really helped flesh the two out in a time where they didn't get a lot of attention. Although some elements could be considered an answer to fandom criticisms, I think the core value lies in what the characters did rather than the more meta conversation. If issue #3 set the bar, this issue jumped the highest. 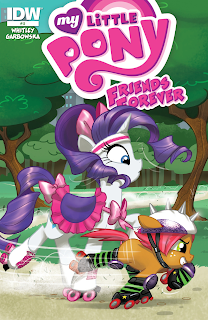 Although the story leans more towards Rarity's perspective, Babs is given enough time to be shown as a full character. I cannot name a more disparate pair to headline a comic and yet it worked so well. This story was well-written, well drawn, and thoroughly enjoyed. 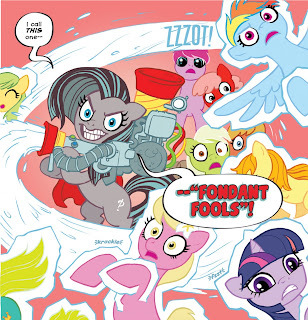 It also featured roller-derby Cadance as "Shining Harmer." I defy anyone to say that isn't awesome. Hm. 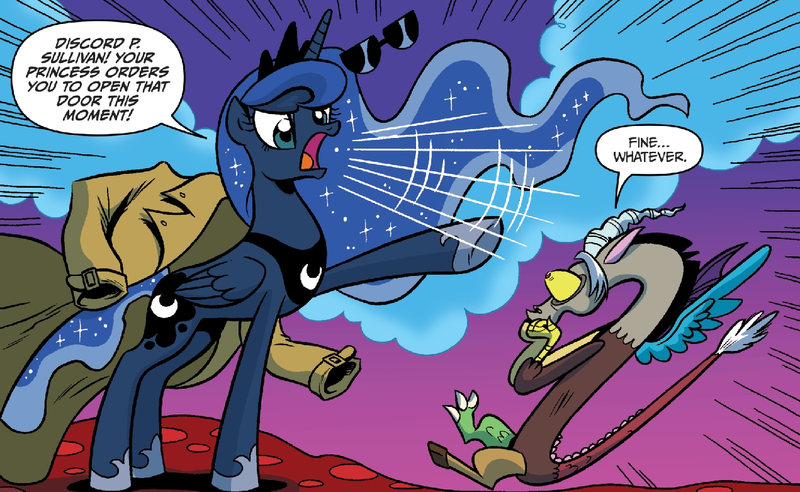 Twilight likes Roller Derby Cadance as well! I don't know if any MLP line will enjoy the same flexibility as Friends Forever. 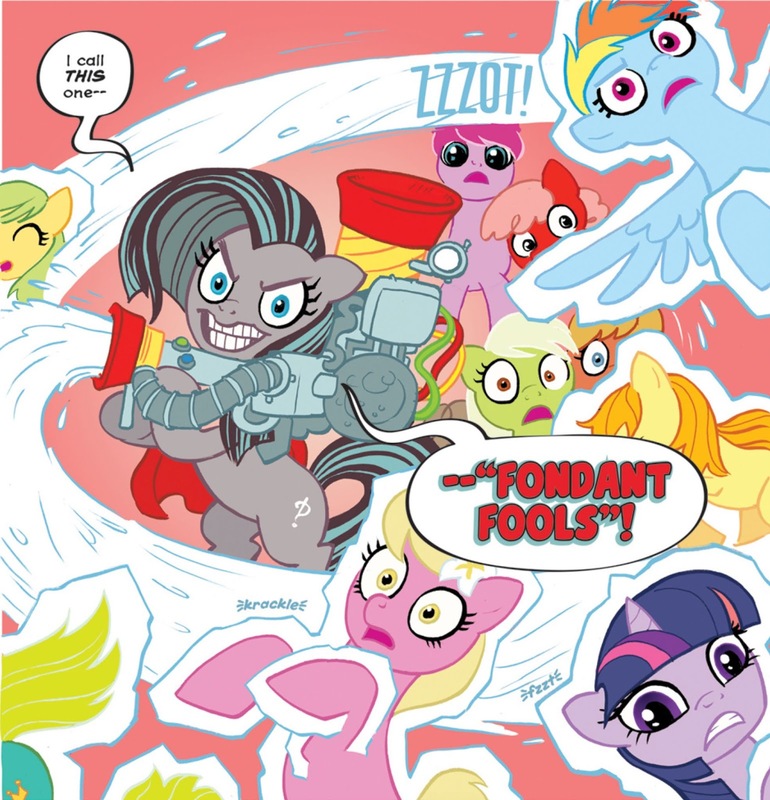 Many of the new lines seem to be tie-ins with the current season or other media. Yet I hope that IDW will display the same willingness to expand and reconsider Equestria with future issues. 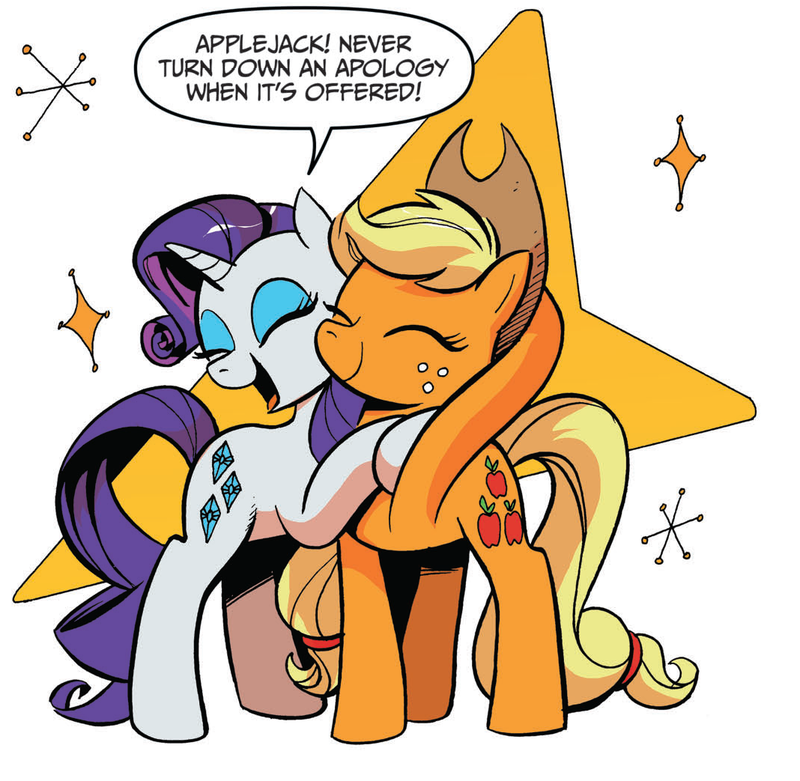 just try not to ship these two! 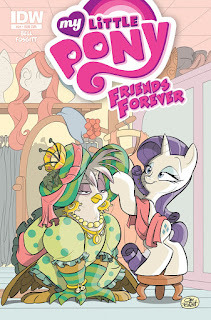 So what are you favorite Friends Forever stories? Please let us know in the comments.